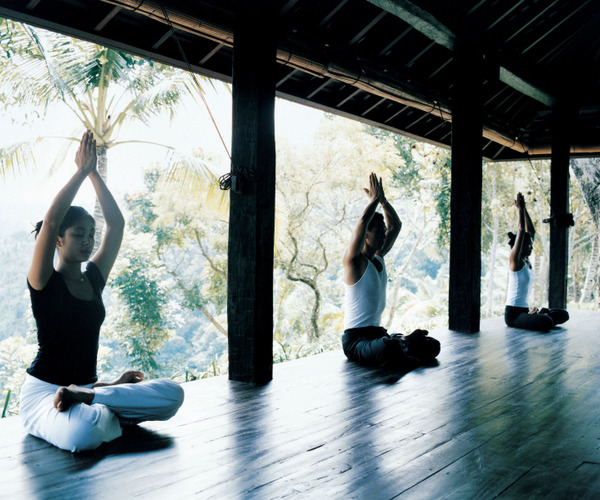 COMO Shambhala Estate in Bali is a residential health retreat dedicated to improving wellbeing. Como Shambhala uses a holistic approach, offering guests new challenges designed to inspire a lifetime devoted to better health. Comprehensive activities and yoga retreats are available in an atmosphere of total luxury. The spa provides everything from lifestyle coaching to spa treatments using native spring waters. Spa therapists, consultants, and activities guides are all dedicated to giving guests at COMO Shambhala Estate a full immersion in a healthful experience. The staff includes an Ayurvedic doctor and Oriental Medicine doctor, as well as fitness, yoga, and Pilate's instructors. The selection of personal programs includes Ayurvedic, Oriental Medicine, cleanse, stress management, be active, and rejuvenation programs. Yoga and Pilates retreats will be held throughout the year. The extensive spa facilities include nine treatment rooms, three of which are for couples, an outdoor hydrotherapy area, swimming pool, yoga room, Pilate's studio, separate male/female steam and sauna, fully-equipped gym with dramatic views, and consultation rooms. Kedara (a water garden whose name translates to "meadow of water") that occupies a secluded area above the river consists of four pavilions, each with expansive rest areas and outdoor baths and showers. The Vitality Pool is 603 square feet. The spa, like the entire resort, is supplied with water from The Source, a natural spring revered by locals for its healing properties. The spa's architectural plan, overseen by Cheong Yew Kuan (who conceived the original COMO Shambhala Estate), incorporates local stone, wood, and traditional alang-alang roofing. In the interiors, the uncomplicated, succinct approach of designer Koichiro Ikebuchi is evident. COMO Shambhala Massage, the spa's signature treatment, is gentle and soothing, with comforting massage strokes and wave-like body-rocking motions. Conducive to instilling a sense of peace, it is an ideal choice to relieve jet lag or normal daily stress. The Estate's staff is on hand to arrange shopping trips, festival visits, and guided explorations through the region's Ubud's temples, galleries, and artists' ateliers. COMO Shambhala offers five individually decorated residences—Bayugita, Tirta Ening, Tejasuara, Wanakasa and Umabona—dramatically set within lush forestland, above the River Ayung. Guests may reserve individual suites or rent an entire residence. Private and retreat villas, popular with couples and solo travelers, provide a more-secluded stay; some include their own spa facilities. 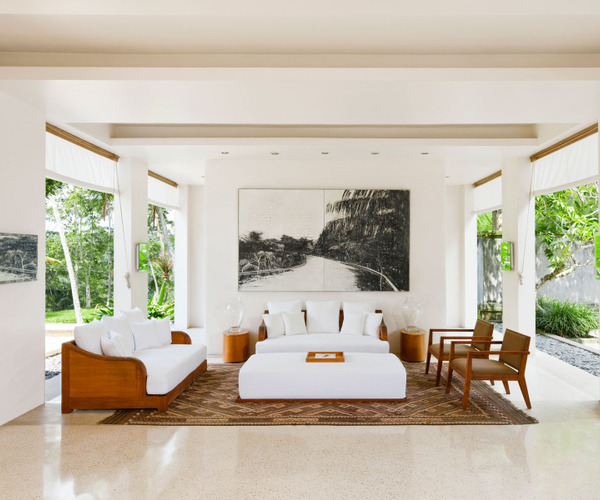 Contemporary-styled interiors are accented by indigenous decor, and each residence features a large swimming pool, lounge areas, and shaded pavilions. Glow, the Estate's signature restaurant, features fresh, healthful Como Shambhala cuisine. Delectable offerings may include lime leaf, chili, and coconut curry, seared mahi-mahi with baby zucchini, and chickpea and mint salad with preserved lemon and sumac dressing. The contemporary-style eatery is designed with an open kitchen, where guests can enjoy watching their meals being prepared. Kudus House, open for breakfast and dinner, is located in a 150-year-old Javanese house and serves traditional Indonesian dishes that highlight the region's flavors and spices.